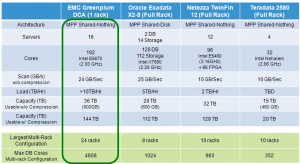 The Data Computing Appliance, first deliverable from EMC’s acquisition of Greenplum, was announced last month, only 75 days after the acquisition closed, and it doesn’t lack for ambition. Pat Gelsinger, EMC CEO, pointed to the high level opportunity: unlocking the “hidden value” of enormous and growing data assets every company is increasingly holding, and often failing to leverage. The appliance will reach many hitherto untapped resources in the data centers that EMC occupies. Adding EMC’s manufacturing, sales and marketing, and reference architectures to the Greenplum IP brings what Gelsinger calls Greenplum’s “first phase” to its completion. And begins what is likely to be a sizable battle with Oracle, Teradata and IBM, if EMC mounts campaigns and spending to match its ambitious vision. The Data Computing Appliance has a preloaded copy of Greenplum Database version 4.0 on a full or partial rack or racks of servers, storage and networking in an MPP configuration. A single rack has 16 servers, with two Intel E5670 6-core, 2.93GHz processors each. Each rack holds up to 36 terabytes of uncompressed storage, and 24 of them (with 4,608 cores) can be combined to hold 5 petabytes after compression across 24 racks. All this is Dell hardware today, but one can imagine we will see other hardware opportunities ahead, especially given that Greenplum will run on EMC’s Vblock infrastructure packages from the Virtual Computing Environment coalition. Note that Cisco plays there – and wants to get into the hardware business too. I’d imagine other shoes will drop before too much time goes by. 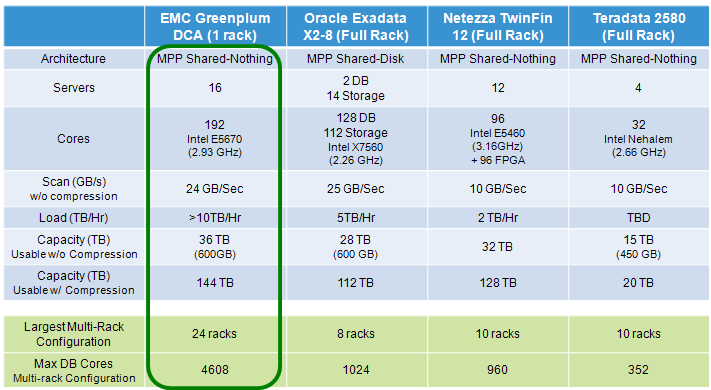 Meanwhile, EMC is calling itself the biggest and baddest box on the planet. Click the image to enlarge. Some of the key marketing themes are already evident in the early story: from the label (The Answer Machine) to the attributes EMC is leading with: performance, volume, load time and “private cloud virtualized infrastructure for analytics.” EMC has tapped into the key themes of the emerging market for analytic platforms and is ready to talk the talk. Rolling out customers like the operator of the NY Stock Exchange (NYSE Euronext) and ClickFox to drive the message home, EMC can throw considerable weight behind an offering that had achieved substantial momentum before its acquisition.